Victoria spent her life being traded between her social worker and one foster parent after another. This continued until the age of ten when she was deemed unadoptable. The Language of Flowers follows two timelines: the first is when Victoria turns eighteen and is finally living on her own. The second is when she was nine-ten years old and living with her last foster mother, Elizabeth. Elizabeth taught her the Victorian language of flowers and Victoria later uses it to communicate her feelings of anger and sadness while being able to remain isolated from others, who don't understand the meanings behind her flowered messages. However, once a florist gives her a chance at a job and Victoria quickly proves herself to be an asset, she also finds that she enjoys using flowers to help others. Victoria isn't sure that anything, even the seemingly magical language of flowers, can help heal her own wounds. I loved this book, it made me feel a complete spectrum of human emotions and also feel them deeply. It is mostly a piece about a very sad person who feels completely worthless in every way, mostly because she has been made to feel that way in every way, slowly find some self worth and love. Victoria learns a lot of things the hard way, going about life without trusting or communicating well and I found her to be very frustrating at times, but given her past it made sense why she did what she did. She was a very believable character that I could still connect with in many ways, even though I hope I would have done several things differently in the same situations. Diffenbaugh writes beautifully, I enjoyed how she played with time by switching from present to past and I wasn't ever confused by it. Especially towards the end of the novel, I found the different timelines to be interwoven exceptionally well. At the beginning I would intermittently feel pity for Victoria (which she would have rightfully resented), but by the end I really knew her and appreciated her, even for all of her faults. I recommend this book to anyone who is looking for an inspiring read, but is willing to go through some sad and sobering content to get to the inspiration. 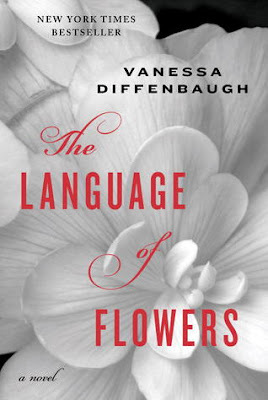 Despite the fact that the Victorian language of flowers was meant to help lovers communicate their deep inner feelings, this book is not a grand romantic love story - as I was expecting. So, go into it with an open mind and you'll find yourself on a very different kind of journey. I really look forward to reading more from Diffenbaugh and in fact she just came out with a new novel We Never Asked for Wings that I have now added to my wish list.